Running as part of the ambitious “Galvanize Sheffield” festival, this exhibition is one of many events celebrating the diversity and vitality of the metalwork industries in a city which has worked hard to revitalise, preserve and promote traditional metalworking skills such as cutlery and flatwares, silversmithing, and jewellery. 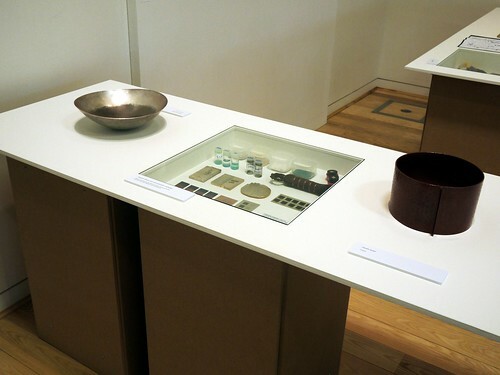 Curated by Maria Hanson, Beneath The Skin is a far-reaching show of work from the cutting-edge of research into metalwork in the UK, both scientific, aesthetic and philosophical, and draws on a wide range of modes, styles and techniques to build a fascinating picture of the exciting range of work being done. Everything about this exhibition is well-considered and repsectful, from the choice of artists to the layout of the accompanying catalogue. 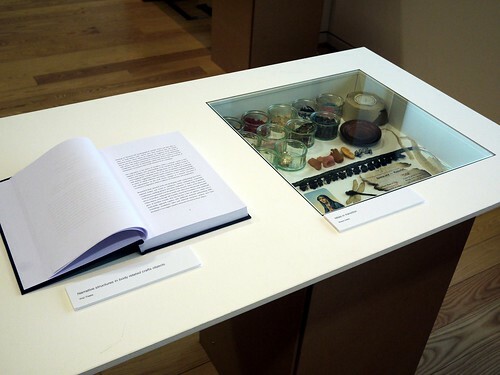 The exhibition has been arranged in the lower gallery of the Sheffield Institute of Arts building, a spacious and calm gallery which invites contemplation of a body of work which demands attention and the respect of considered study. Each of the eight exhibitors is given enough space to allow his or her work to be viewed as an isolated exhibit without removing it from the context of the other works and the video displays and interactive elements are respectfully muted. It is impossible to select one work - or even one body of work - as representative of this exhibition, a problem neatly solved on the advertising and catalogue by the use of a stylised swirl of colour: each of the artists represented brings something unique and fresh to the show thus what follows is a few notes on each of the exhibits. Jivan's deeply philosophical underpinning of her work relates the very current preoccupations of environment and recycling to create anti-commodified works of great beauty, infused with nostalgia. 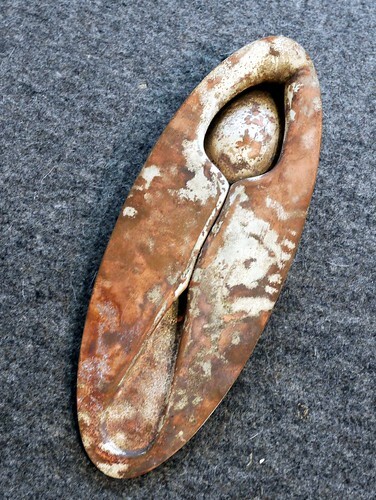 Her work often derives from literature and uses such diverse materials as found wood, ceramic doll parts, pearls, pages from books as well as the more traditional jewellery materials. 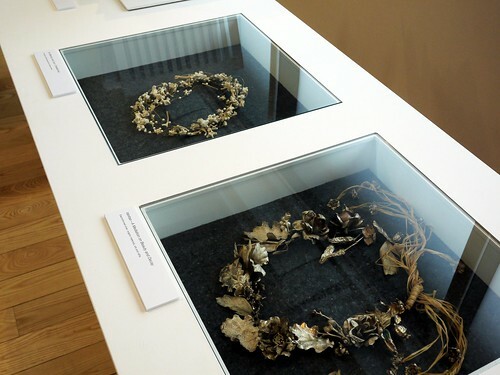 The work – largely neck-pieces - was presented along with several of her weighty philosophical texts and one of the great pleasures of these works is the tension between the immediate emotional appeal that they have and the philosophical investigations which preceded their creation. 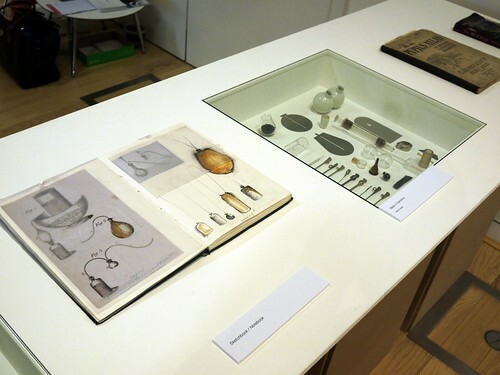 An underlying alchemy – and a love of the same – guides this body of work: mirrors, retorts, laboratory vessels and vintage medical equipment are all present in the source materials which are presented alongside the beautiful, simple and understated objects which Elizabeth has created with great finesse and skill. One of the most striking parts of this exhibit was the sketch-book explorations of the source material and the way in which the finished works – largely in blown glass and metal – explore both the dimensionality of the source and the idea of the “shadow” or the “silhouette” of the source. Jack's work with the brooch form is almost too well-known to followers of contemporary jewellery to allow for the necessary distance to be able to see the work dispassionately. It takes an effort of will to be able to “look again” and to appreciate the forms and narratives which lie behind the finished work. In this exhibit, Jack has presented a series of pieces which make this easier for the viewer by moving his readily-identifiable style forward with a shift of colour-pallet and material, using more white and plain silver than before, using surfaces enhanced by subtle pencil drawings. This work was presented with additional video material and sketch-books: the link between the source material and the finished work is fascinating and intriguing. It would be hard not to laugh at this exhibit. Not because it is in any way laughable, but more because Andreas quite plainly found his notion of defining “spoonness” (the Platonic idea of a spoon) not only engaging but amusing. It is too rare to encounter humour combined with craftsmanship or philosophy, but here all three are pulled together very successfully, engaging with the viewer on many levels. 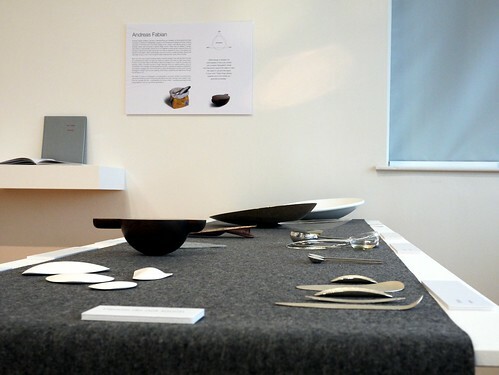 The “spoon” objects themselves are beautifully made from wood, felt, silver, steel and other materials. They make the viewer ask, “In what way is this a spoon”: the answer is always surprising. Chris Knight's work is everywhere in Sheffield: from the fountains at the railway station to the fencing on a car-park, from the Millenium Gallery to St. Mary's Cathedral. It was, therefore, excellent to be able to see some of his more recent small-scale works in this exhibition, notably his now famous “Lest We Forget” chalice. 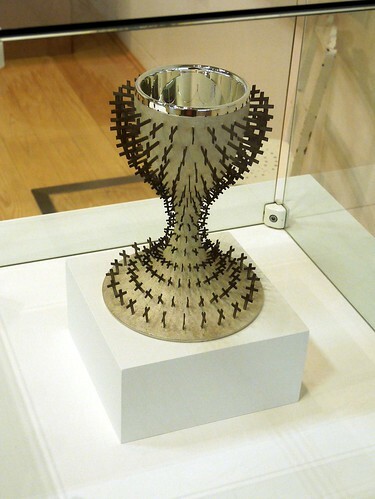 The most interesting part of this exhibit was the way in which Chris works on the interface between CAD and traditional craft, using 3D software to design pieces, laser-cutting on elements of the pieces, then bringing the whole together with the time-honoured traditions of metalsmiths. Since his first forays into metalworking, Cóilín has been fascinated by Japanese metalwork techniques, even to the extent of living and studying in Japan. For his exhibit in this show, he worked with Dr. Hywel Jones, a material scientist, in order to research reliable methods of using the Irogane metals and the colouring of these. Additionally, he invited Dauvit Alexander, Fabrizio Tridenti and Grace Horne to take some of these materials and to produce pieces using them in their own way. 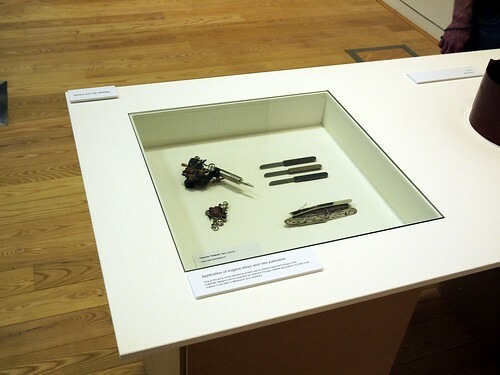 These pieces – a tattoo-machine by Dauvit Alexander, knives by Grace Horne and a brooch by Fabrizio Tridenti – plus several bowls by Cóilín show the potential for western artists to use these materials. Using wool and found objects, Laura explores the ideas around what is precious to the individual in opposition to more generalised concepts of preciousness. A colourful and deteminedly craft-based exhibit, she boldly – shamelessly – embraces the current Etsy-mentality craft aesthetic, combining it with her post-feminist ideas about nostalgia and childhood, even incorporating wooden knitting machines and a toy periscope into her narrative. Focussing on the surface of enamel itself, Jessica's works transcend the usual concerns of enamel with colour and/or the manner of application. Her skill in using the tricky medium is phenomenal and in some ways it is quite sad that the majority of people who see her work in this exhibition will not be able to appreciate the technical mastery displayed here. Anyone, however, will be able to admire the pure and elegant simplicity of the work, much of which explores ideas of mark-making and the disruption of surface. 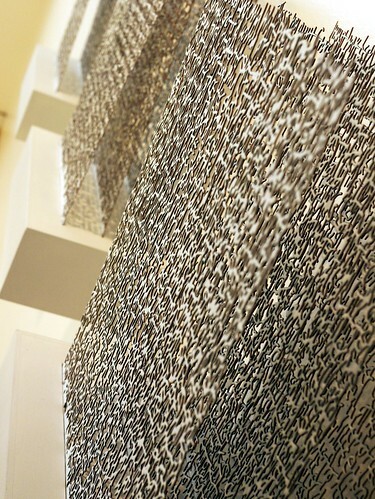 Much of the work is based on writing or cipher-like intrusions into fields, the idea of palimpsests and this is combined with larger-scale enamelling techniques such as those used in industry for the production of enamelled panels. 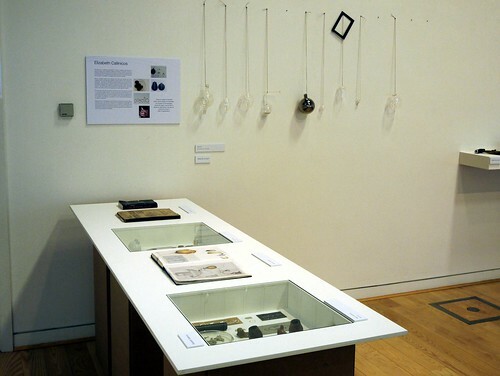 Overall, an exciting, thought-provoking and intriguing show and one which it is hoped will be sent out on tour to further general awareness of the range of activities being undertaken by contemporary jewellers and metalsmiths in the UK today. This is just a glimpse! It took hours to go round. Thank you for this detailed presentation of the exhibition. The work presented is very interesting and diverse.